The Conservatives have held onto their substantial majority on Daventry Council. The Tories have held power in Daventry since 1999. The Party now has a majority of 24 over the other parties. It also means that the council has only ever been run by the Conservatives - or no overall control. The Conservatives have held onto their overall majority despite losing seats. 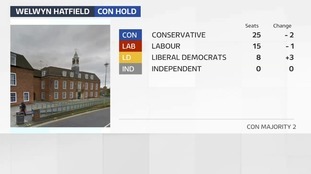 It was a good night for the Lib Dems who gained three seats to take their total to eight. The Tories have held power in Welwyn since 2002. They currently have a majority of 2 over the other parties. Labour have once again held onto their majority on Cambridge City Council. They re-gained power in 2014 for first time since 1998. It was run by the Liberal Democrats from 2000 although they lost their overall majority in 2012. The Conservatives have held their majority in St Albans City and District Council but the Liberal Democrats will be pleased with the night they've had. The Tories lost a seat while the Lib Dems gained two.